Davies scored an unbeaten 100 and shared a fourth-wicket partnership of 148 with Jake Peach (48). This built on the solid start provided by Tom Benfield (25) and his brother Matt Benfield (58) as the visitors posted 249 for four. ‘Jack has batted superbly all season and is the leading run scorer (584) in our division,’ said captain Kieran Dunston. ‘That is his third century this summer. Bashley’s bowlers were slow to spot his strengths and he exploited it to the full. ‘All together it was a fantastic batting performance with others also doing well. ‘It makes us mathematically safe. We are happy to consolidate in our first year back at this level. ‘At the same time we also feel we could have done better. There was no way back for Bashley after Chris Turrell (three for 33) reduced them to 17 for three. 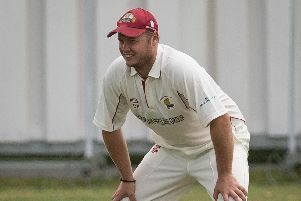 Purbrook’s promotion hopes were dealt a blow by a three-wicket defeat at Fawley. Put into bat, they were bowled out for just 66 inside 30 overs. Josh McCoy took six for 47 but the relegation-battling hosts managed to edge home. Havant II will have to win their final game of the season and hope other results go their way to avoid relegation to the Hampshire League. They fell into the bottom two following an 86-run defeat at the hands of leaders Fair Oak. Hambledon sealed their safety with a 23-run win at South Wilts II. Henry Glanfield (71) top-scored and was ably supported by Alex Willoughby (65) as the visitors posted 244 for six. Off-spinner George Harding then took two for 36 as South Wilts were restricted to 221 for seven. Rhidian Chapman also played a key role taking a wicket and conceding just 25 runs from his 10 overs.